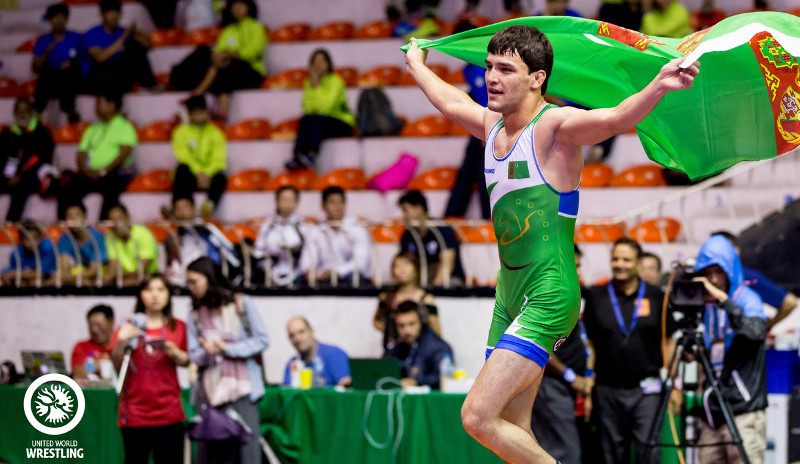 AKIPRESS.COM - Seydulla Tazayev of Turkmenistan won a gold medal in Greco-Roman wrestling in the weight category up to 60 kg at Asian Junior Wrestling Championship in Chinese Taipei, the state news agency reported. Seydulla, 17, had a tough road to the 60kg Greco-Roman finals, wrestling back from an early deficit in his quarterfinal and finals match. In the quarterfinals Tazayev was trailing by four points early, but came back to score 17 points on his way to a 17-10 victory. In the finals Tzayev was trailing Keremat Abdevali of Iran by three points with less than ten seconds remaining in the match, but found his way to a high dive takedown for four points and the gold medal. Kyrgyzstani wrestler wins gold at international tournament in U.S.